The perfect traditional stuffing for Thanksgiving or Christmas. Just 30 minutes and can be made ahead of time. Perfectly seasoned, fluffy, with sage, thyme, rosemary and dried cranberries. To toast the bread: Preheat your oven to 400F (200C). Spread the bread cubes across two large baking sheet. Bake for about 5-8 minutes until dried out and very lightly browned. To make the stuffing: Melt the vegan butter in a large skillet or pan over medium-high heat. When melted add the carrots, celery, onion, and garlic. Sauté for about 5 minutes until the veggies soften and begin to brown. Stir in the thyme, rosemary, sage, salt, and pepper. Then add the toasted bread cubes, vegetable broth, and dried cranberries -no need stir at this point. Remove the pan from heat and cover, then let sit for 10 - 15 minutes until softened. Once softened it will be easy to stir, so stir well to combine and serve hot. *I find some types of bread are more absorbent than others so if 1 cup of vegetable broth was not enough to reach desired texture, add a splash more, cover and let sit again until desired texture is reached. 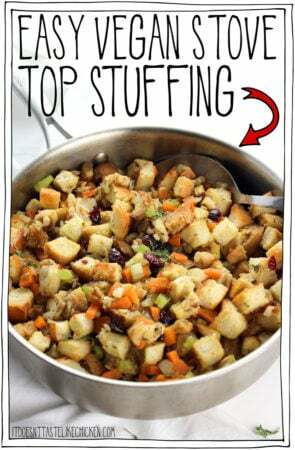 This stuffing can also be made ahead and reheated with a splash more vegetable broth as needed, making it the perfect stress-free side.